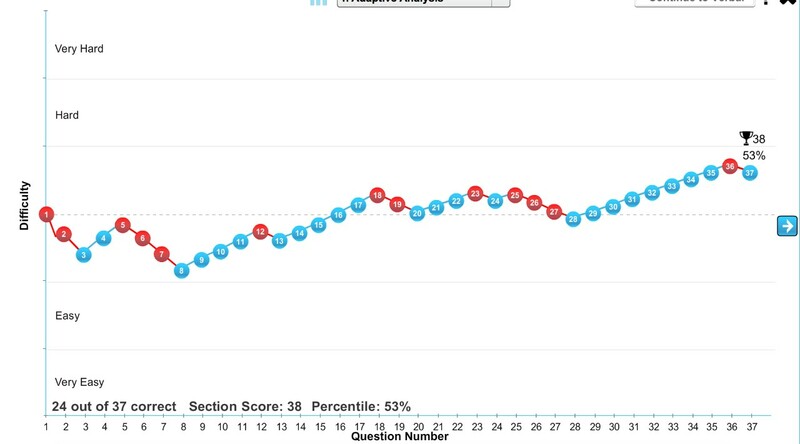 The graph below shows someone’s performance on a GMAT practice test quant section. His progress through the section goes from left to right. The red circles represent wrong answers, and the blue green circles represent right answers. The higher the circles are located on the graph, the higher his score level. He ended up at 38. There are some key takeaways you can get from the graph. First, you can see that he started off weakly, getting the first two questions wrong, getting a couple of easy ones right, and then getting three more wrong before he started more consistently getting right answers. The other thing that jumps out is that most of his missed answers are in clusters. When he missed one, he often missed the next one or two. Now consider the following. Other than at the weak start, his trend through the entire section was upward. 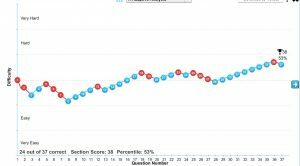 So while he ended up at 38, it seems entirely possible that had he started out more strongly and had he not followed missed answers with more missed answers he would have scored on the section significantly higher than 38. So what could he do to score higher? Learn more quant concepts and do more practice questions? While doing those things would probably help, I think some mental preparation would help a lot too. Here’s what I recommend for performing at a higher level. To start strongly, rather than weakly, when you are taking the GMAT, one thing that you can do is to warm up before taking the test by doing some practice questions. I first got this idea by reading the debrief of someone who had scored 800. To calm himself before the test, he did practice questions. One’s mind is complex and constantly adjusting. So one can be in GMAT mode to a greater or lesser degree. By doing some questions before you take the test, you remind yourself what getting right answers takes and get yourself into GMAT mode. So to mentally prepare on test day, and before practice tests, you could do some questions before you take a test. When I did this, I found that taking the test felt like an extension of a practice session, and I just settled in and got right answers. Now to deal with those clusters of missed questions. Probably the reason for those clusters is that the person who took this section had a tendency to respond fairly negatively or feel down when he had trouble answering a question. So, because his mindset was so affected by having trouble getting the answer to one question, he would miss more, maybe until he saw a question that he readily knew how to answer, possibly because as he missed answers he was served easier questions. So, if freaking out, getting annoyed or otherwise responding negatively or suboptimally to having difficulty with a question can affect one’s performance negatively, one way to score higher is to learn to freak out less and remain calm and positive more. If you have a tendency to freak out or be devastated by a low practice test score, a missed question or any type of performance that you are not satisfied with, to play the GMAT game at a higher level, and to live better in general, you have to learn to respond differently to challenges or issues. One reason people respond negatively to performance that they are not satisfied with is that they feel that somehow that performance means something key about themselves. Rather than seeing the performance as a temporary result of what they have done so far, they see a test score, a missed question or anything else that they do as somehow indicating something permanent about themselves, and that type of thinking is flawed. The truth is that any person is constantly changing and developing, and one’s performance can always somehow be increased or changed. A nervous person can learn to remain calm. A person who has trouble with logic can learn to use logic effortlessly. A person who tends to get angry and negative can learn to live in more positive ways. A person who scores 400 on the GMAT can learn to score 800.We are always learning and developing. Beyond that, it’s key to realize that responding negatively and getting down or “devastated” does you no good whatever the situation. The more clear this is to you and the more you learn to respond optimally to anything that goes on, the higher you will score on the GMAT, and the better you will do in life in general. When you are taking the GMAT, one thing you can do to respond well to challenges and issues and prevent clusters of missed questions is to seek to focus on just getting the right answer to the question at hand. Another thing that all of this illustrates is the value of taking GMAT practice tests. Taking practice tests gives you opportunities to learn to do things like starting off strongly and remaining calm if you are having trouble with a question. So, as you prepare for the GMAT, remember that there are multiple ways to increase your score, and mentally preparing and working on your mindset and how you respond to challenges and issues are some key ones. Well Marty, thank you for this tip – this is handy for anyone preparing for the GMAT! Thank you, Marty – I must say that the practice of mindfulness meditation and visualization is changing me. I’m even starting to remember my dreams! I can’t wait to see how I will perform on my next CAT.